It’s Tax time again and as since I’m one of those lazy people who does all the work at the end, instead of keeping up with it as it goes along – the first thing I need to do is update my Allowance calculator spreadsheet. I’m posting a copy of the sheet here for you guys to download because each year more and more crew ask for a copy and I can’t remember who’s asked for it and who hasn’t. In this post, I’ll discuss the basis for the tax refund, and how to use the spreadsheet. Sorry – but this Excel spreadsheet is all care and no responsibility on my part. I’m using it myself and so I have certainly checked it as best I can to determine if there are any errors – but I can’t promise there aren’t any. Feel free to look through all the tabs at the tables of values I’ve taken from the current TD to make sure there aren’t any entry errors – please let me know if there are via the comments at the bottom of this post and I’ll fix it and re-upload. Essentially the Australian Tax Office produces a Tax Determination each year which covers this issue. There’s a new one each year and it’s urbanely titled “Income Tax : What are the reasonable travel and overtime meal allowance expense amounts for the 20XX-YY income year?“. The TD determines the maximum reasonable amount for overnight allowances (without receipts). The amount is determined by location (separate listings for Australia Cities vs Overseas Countries/Currencies) and are also affected by salary level – the concept being that if you earn a lot more, you are allowed to spend a lot more when you’re on a trip. I wish. 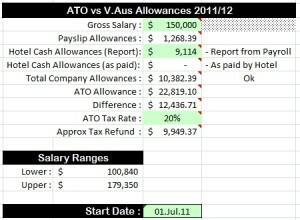 As you can see – the ATO values are in excess of the allowances typically paid to crew, irrespective of salary band. I would encourage you to read through the TD in detail, but basically it says that if your company pays less than the ATO allowance for overnight expenses (Meals and other Incidentals) you are entitled to claim the difference between what the Company pays and what you actually spend, up to a maximum threshold which is the ATO allowance. Notice that you can claim the difference up to what you actually spend – which may be less than the ATO allowance. That said – the TD says that while you can’t claim what you don’t actually spend – you don’t have to provide receipts either. For Australian Stations, how much the ATO allows is a combination of a meal allowance (eg: if you’re “on station” anywhere between 0600am-0800am, you get a breakfast allowance) and an “incidental allowance”. The incidental allowance is paid for each day you touch while you are on station. Note that the actual meal time bands are not published anywhere in TD 017/2011. I’m still hunting down an ATO reference, but apparently the ones the Company uses are based on the ATO time bands. For International Stations, while there is a concept of Meals – time bands are not applied and instead for each day (or part thereof) you are “on station” a combination of all the meal allowances (brekky, lunch, dinner) and the incidental allowances is paid. In the past there’s been a lot of too-ing and fro-ing about this (as you can imagine). My accountant has allowed me to claim this for four years now and since he worked for the ATO for many years – he’s is extremely conscious of what is and isn’t kosher when it comes to income tax deductions. owever I’ve had a number of pilots and cabin crew tell me their accountant has said it’s not kosher. If your accountant has issues, and you want to persist with it – I suggest you talk to my accountant about it. He’s had extensive discussions with the ATO and two years ago obtained a judgement/ruling in this area. He can be reached via his web site. As an aside – he’s been my accountant for about 9 years now and I have no hesitation in recommending him. The cash allowances we now receive down route complicates things a little. You will need to provide the details of this money to your accountant and the ATO. This can be done in one of two ways. [REPORT] Get a report from Payroll (payroll.queries@virginaustralia.com) which will give you a total in Australia dollars. The former method has the advantage of being highly accurate. The latter (report from payroll) is difficult to check for accuracy. Please note I have labelled the two methods above CASH and REPORT – this is because the spreadsheet allows you to do either of these methods, and later I’ll show you how. The Summary sheet will advise the totals – but I just give the whole sheet to my accountant. The spreadsheet is protected against accidentally overriding the formula’s – the green cells are where you can enter values. Basically, you need to log onto the portal and run V-Claim and look at your past payslips. For each two week pay period – take the value you were paid in allowances by the company (“Meal/Incidental Allowances”) and enter it against the correct date in the spreadsheet. Where you were docked overpayments (or paid extra) – these are to be entered too, even if it means entering negative allowances for that payslip. Note this amount will NOT include allowances paid in cash over the hotel check-in desk. That’s handled elsewhere. Summary Page – Basic Variables. Enter your approx Gross Salary into the green box. If you are using the [REPORT] method to determine cash allowances paid down route – enter the total from the report provided by Payroll into the Hotel Cash Allowances (Report) green box. Otherwise – leave it blank. ATO Tax Rate : when you look at how much tax you paid last year, divided into your Gross Income – you can get an approximate percentage figure. Based on this, the spreadsheet can estimate what you’re allowance refund should be – which is Allowance Difference x (1 – %Approx Tax Rate). This will give a “best guess” at how much you can expect to get back on your allowances. Once you have completed the Duty Log section of the sheet, you’ll get the following values on the Summary Sheet. Payslip Allowances : Summed from the table (on the left) you entered them into. Hotel Cash Allowances (as paid) : If you enter all the local currency cash paid down route onto the Duty Log sheet – it’ll be summed here. Total Company Allowance : The addition of the Payslip plus Hotel Allowances. ATO Allowance : This is how much the ATO calculates Crew Allowances at for Tax Purposes – based on your roster entered on Duty Log. Difference – the gap that you can claim. Approx Tax Refund : Based on your ATO Tax Rate this is a general stab at what you should get back. The time between arriving (sign off) into BNE and arriving back into SYD after the domestic flight. Note : It doesn’t matter where your domicile is – all these calculations are to be Sydney based, as your roster is. Note : All Dates/Times are Local Time, wherever you are. Remember that you are only addressing periods of time between flights or during ground duties such as SEP or CRM, which are NOT at your home base. Thus you can’t claim anything for SEP in Sydney – but you can if you are flown to BNE for SEP training. In which case you would claim against the time away from SYD : From the time you go on the flight in SYD; until when you got off the plane again back in SYD. (A) Date : The Date column is pre-filled with a Date for each day of the tax financial year. For each FLT or GND duty – you place it on the date that the allowance claim period started. So you start claiming an LAX layover period on the day the LAX flight departed Australia. However if you land after midnight after flying into AUH – you would start your claim on the day after the flight departed SYD – does that make sense? (B) Duty Type : Duty Type is either FLT (Flight); GND (Ground Duty – Meetings, SEP, etc); or SIM (Simulator Training). You can enter it or choose it from a dropdown box. (C) Station : This is the three letter code for the layover airport. This determines whether the station is Domestic or Overseas, as well as linking into the exchange rate later on. You can enter it or choose it from a dropdown box. (D) Start Time : This is a time (entered in 24 hours time with a colon, eg 23:40) which denotes the start of the period for which allowances are to be paid. For LAX/AUH flights – this is the Sign Off time after you arrive into LAX/AUH. (E) Start Date : The date is automatically filled in from the first date column and is only repeated for convenience. Again – watch out for AUH flights that get in late after midnight. (F) Stop Time : This is the time at which the paid layover period ends. For LAX/AUH flights – this should be the Sign On time for the return flight. (H+I) Start / Stop Date/Time : These two columns are the calculated start and stop date/time based on what you entered. Have a quick look at these two after you enter in your values to make sure you’ve done it correctly. (J) Cash Allowances Hotel Paid (Local $) : If you are going to use the [CASH] method for down route allowances, enter the amount in local currency you were given here. This will be converted to AUD using the RBA exchange rate on that day. (K) Cash Allowances Hotel Paid (AUD $) : If for some strange reason you want to enter your [CASH] Hotel paid allowances in Australian Dollars (Why? Why?) – you can do that here. If you enter both $Local and $AUD – the sheet will get grumpy at you. Be warned. (L) Total Cash Allowances (AUD$) : The sheet will calculate the AUD amount of allowance paid over the counter by the hotel based on what you entered into the previous twe columns. But you only used one of those columns – correct? (M) Done : If the spreadsheet has enough information to calculate – there will be an Ok in this column. Otherwise it will be blank and you should go back and see what has been done wrong. (N) Days : This is the number of days you were on station, rounded up to the next whole day. This number forms the basis for the Incidental Allowance calculation, and the Day of Meals calculation for International Layovers. Ground Duty not in SYD. Here is an example of how a ground duty somewhere other than SYD is claimed. Basically you claim from the time you board the flight in SYD, until the time you get off the flight back into SYD after ground training in BNE, three days later, or whatever. Where is all the work done? (O) … (Q) Aust Brekky/Lunch/Dinner Rates – this is the rate breakfast is paid at for the nominated duty (whether or not you were on station for Brekky). There will be no figure here for Non-Australian layovers. (R) ATO OS STN – this is the ATO overseas country classification (OS1 / OS2 / … / OS6) and is selected by the sheet based on what you entered (eg: AUH, LAX, KUL, etc). (S) Non-Aust Daily Meal Rate – Overseas allowances are based on Meal Values, but paid daily instead of with time bands. As such this column has the daily rate that will be paid for the duty. (T) ATO Incidentals Rate Per Day – this is the Incidentals rate (whether based on Domestic or International calculation). (U) … (W) Count of Brekky/Lunch/Dinner Paid – This counts the number of Breakfast/Lunch/Dinners that you were on station for during the layover. Your stay only has to touch the nominated period. (V) … (Y) Totals and Cumulative Total – This totals up the Meals, Incidentals and Total Allowance for the period specified in this row of the spreadsheet. The Cumulative keeps a running total of ATO Allowance Calculation to date.Support Pages – ATO_Low / Mid / Upper. The meal time band tab contains the start and stop times for breakfast, lunch and dinner which is used in the calculation of Australia allowances only. This sheet contains a list of stations we fly to (domestic and OS) and stores the equivalent ATO allowance amounts from the Taxation Determination. If you want to compare TD17/2011 with the values I’ve entered in the spreadsheet (and fix them!) then you do so here – but let me know if you spot a mistake please! Since 02.May.2010 allowances have been paid in cash over the counter at hotels. In order to account for this, a currency conversion is required. I’ve used rates published by the Reserve Bank of Australia for the various countries as required. The company exchange rates (as reflected in the Payroll Report) do not reflect real-world value of the money we’re paid over on the day as closely as the current exchange rate on that day from the RBA. And there you have it. If you have any questions, comments, suggestions – please leave them in the Comments area below this post. If corrections are required to the sheet, I’ll make the updates as necessary.